The Sig Sauer P365 is a sub compact polymer frame pistol geared towards individuals that want a low print, easily concealable firearm for their every day carry 365 days a year. (Hence the P 365!) One of the main "pain points" with this firearm is that there is a low amount of surface area to grip, ultimately leading to reduced control and a decline in accuracy. We here at NDZ Performance understood this and decided to do something about it! Enter the NDZ Sig Sauer P365 Magazine Grip Extension. 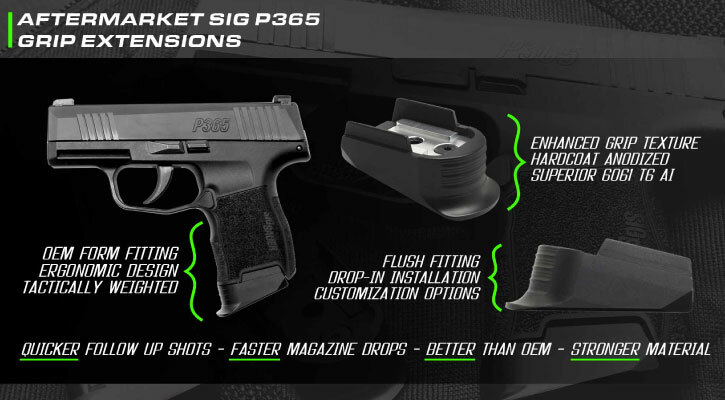 Our patent pending and industry first design allows you to upgrade your stock Sig Sauer P365 magazines with our P365 accessories! Drop-in installation at it's finest. These magazine plate upgrades convert your OEM magazine into an extended magazine. This will help with dexterity, grip, and over-all accuracy. Added magazine weight will help with ejection and mag drop, incrementally increasing your cycling times. (Something the plastic upgrades from manufactures like Pearce can not achieve) Choose from a great variety of colors. We also have laser engraving options available to really personalize your new magazine plates (over 1200 logos to choose from!). Please help us to spread the word, we are really excited about this awesome product! Orders over $19.99 ship free. 1.5% back on purchases from our NDZ retail store. Super fast same day shipping.